Shearer Golf Design Australian based golf course architect. Designing courses in Australasia, China, the Middle East and Europe. Bob Shearer. We believe that the whole experience from the initial consultation to the act of playing a round of golf should be an enjoyable one. Bob's wide experience playing golf around the world has helped him become a designer sensitive to the needs of the natural environment, aware of the developer's wishes to create an economically viable project and an understanding of the players' desire for an interesting and challenging journey. 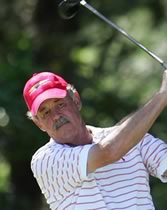 However Bob's love of playing the game was still great so he combined his new business with the European Seniors Tour. He started out helping existing clubs remodel and upgrade their courses in between competition on the Tour. Gradually the design business has taken over priority and new courses are now being designed and constructed in Asia and Australia by Shearer Golf Design.